Falling somewhere between quiche, pie, and frittata is this fool-proof tart (the thing defies labels, but I’m going with tart, because I like the sound of it) I made for brunch the other day. It was the first time I had people over for a meal in my new Cairo apartment, so for the egg dish I wanted something special. It’s crustless, which means it’s easy to throw together and a great complement to a brunch that’s already cluttered with baked goods. This recipe, adapted from the original – posted by Leela Cyd (check out her blog for extra stunning photography & recipes) at The Kitchn – struck me first because of the way it was described as a part of a Paris meal, second because it has so few ingredients, and third because it was billed as fit for any time of day. Exactly – though I’d add that it’s also versatile enough to work year-round: it’s one of those magical vacuum cleaner recipes (like come as you are soup or pizza-any-way) that beautifully absorbs much of what you’ve already got lying around. For this version, I picked up some leeks and beet greens from the market and threw in a few tomatoes from the kitchen that were about to go bad. The result was the star of brunch. I made it again a few weeks later for Christmas morning (and day…and evening) snacking. 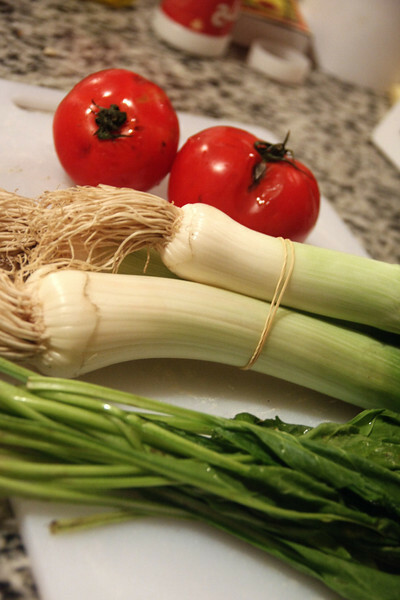 First thing is to caramelize your leeks or whatever onion-like vegetable you’ve got. 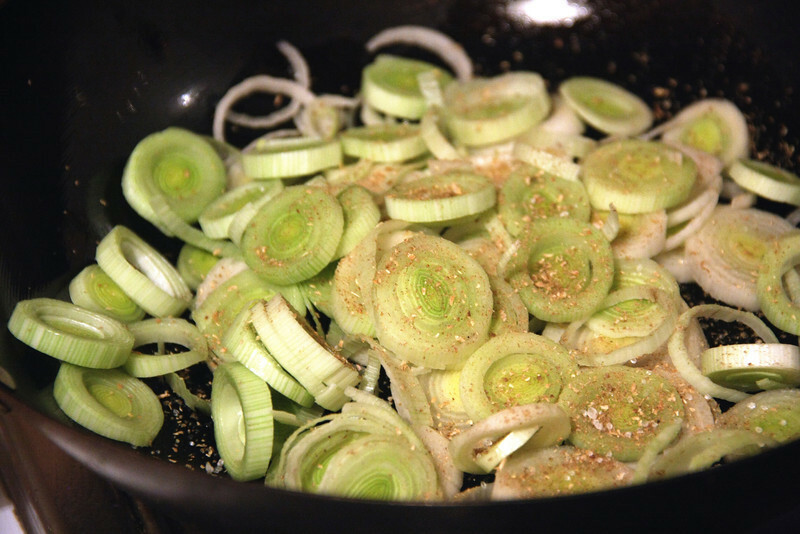 (Tips for caramelizing here.) For this recipe, I like to toss in about a teaspoon of brown sugar and coriander as they turn translucent to give it a little extra fragrance and depth & balance out the savory elements going on elsewhere in the tart. Just at the end of the caramelizing process, throw in your greens – sliced up chiffonade style – and stir them around until they just start to wilt. In the meantime, preheat your oven to 400 degrees Fahrenheit and prep your other vegetable(s) – if they’re good to go raw, like tomatoes, you can just save them and mix them in at the end; if you’re using something like mushrooms, toss them into the pan halfway through the caramelizing process so all those delicious juices break down and meld together. Next whisk together the cheese, ricotta, and eggs in a large mixing bowl. Throw in a bit of salt and a bunch of black pepper. Once all your vegetables are prepped, mix those into the egg & cheese custard as well. 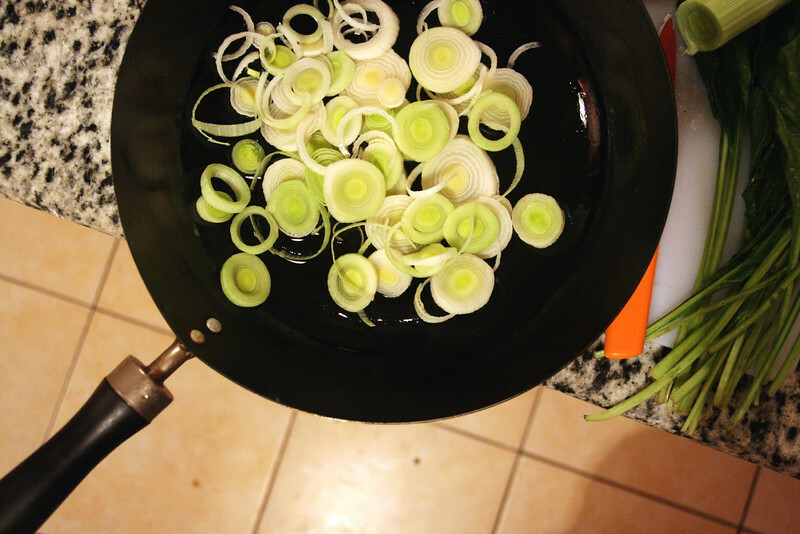 Brush a 9-inch pan with olive oil, pour in the filling, and pop it in the oven. Bake it till it’s set – usually 30 to 40 minutes, depending on your oven. The top will turn a delicious crisped brown. Let it cool for a few minutes before serving. If you’re making it ahead of time, bake till it’s 5 minutes from done and then set aside – and just throw it back in the oven to finish cooking & warm it through before serving.